John Wells, American Comic Book Chronicles 1960-64. TwoMorrows Publishing, 2012. When this entertaining history begins I was ten years old, when it ends, fourteen – my peak comic book reading years. Other than perennial favorites Superman and Batman, superheroes had been in decline. Funny animals and westerns were the most prolifically published comic genres. Walt Disney, “creator of Mickey Mouse and Donald Duck,” was building a theme park. By 1964 superheroes, ressurected antiques from the thirties and forties as well as fresh faces, dominated sales lists across North America. 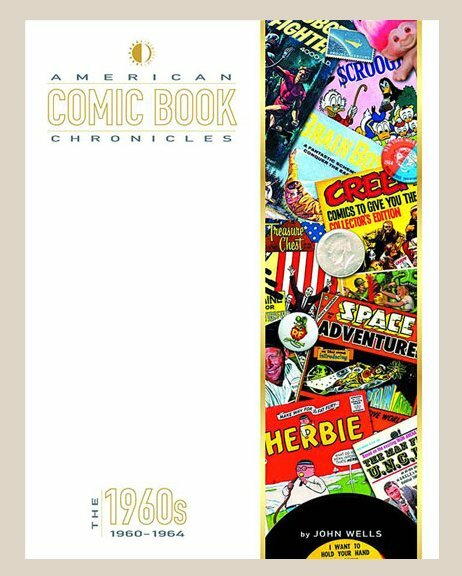 American Comic Book Chronicles sifts through this period year by year, exploring publishers, artists, writers and distributors, who, contrary to our boyhood visions of ‘the cartoonist’s life,’ worked in an often cut throat business environment. Stan Lee was not far off the mark when he coined “The Bull Pen” to describe Mighty Marvel’s New York offices. A shadow industry of scribes and amateur cartoonists sprang forth, working in their bedrooms and studies late into the night with spirit duplicators, mimeographs and hectographs, producing comic fanzines and waking at dawn, blear-eyed, to prepare for the school day ahead. The relationship between fans and professionals was beneficial to both parties in a decade of swift changes that contained freeways, jet planes, television, radio, movies, transistors, and a Cold War. The real story of the sixties was the rivalry between DC and Marvel begun with the appearance in 1960 of The Brave and the Bold No 28 featuring The Justice League of America. Marvel (as it would come to be known) brought out Fantastic Four in 1961 and the company was dominant by the end of 1964. 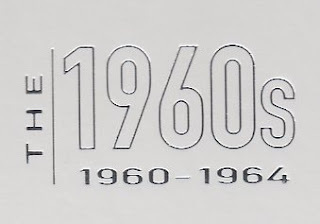 All of the sixties companies are detailed here, including Dell/Gold Key, ACG, Charlton, Archie Comics, Harvey Comics. That ‘Sick Humor’ was drifting in the sixties air, inspiring the “satire” magazines MAD, HELP, SICK and CRACKED. John Wells delivers his unblinking gaze on the creators, the publishers, the fans and the industry, stripping back the shadows with the aid of direct quotes from the people involved in the sixties superhero revival. 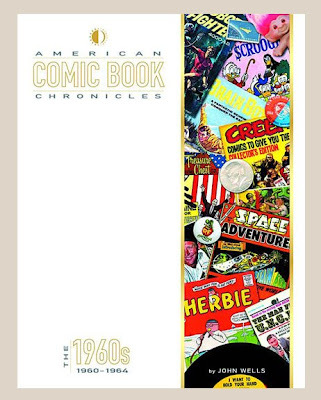 American Comic Book Chronicles 1960-64 is a good start to this colorful historical series, which includes a second volume by John Wells covering comic companies up to 1969. Also promised are 1970s by Jim Beard, 1940-44 by Roy Thomas, 1945-49 by Roy Thomas, 1950s by Bill Schelly. I’m looking forward to reading the entire series. A three part interview with author John Wells is HERE.